With a captivating touch of glimmer to its elegant design, the Medieval Wedding Dress is the perfect choice for special occasions. This taffeta gown has metallic gold trim down the sides of its front and at its long, flared sleeves. 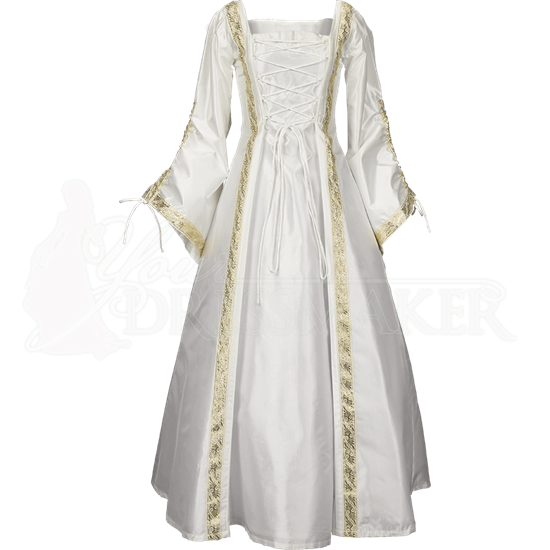 This full length medieval gown has adjustable lacing over the front of the torso and down the back, ensuring the perfect fit. Integrated drawstrings on the sleeves can be cinched up or worn down for an alternate look. Choose from a variety of colors and a range of sizes. This long sleeve medieval gown ensures easy regal beauty at whatever special event you choose to wear it.